Realtors, developers, and transportation planners are pushing the city of San Francisco to consider a plan to remove portions of I-280 and the Caltrains rail-yard. Read more about the proposal in the SFgate link below. 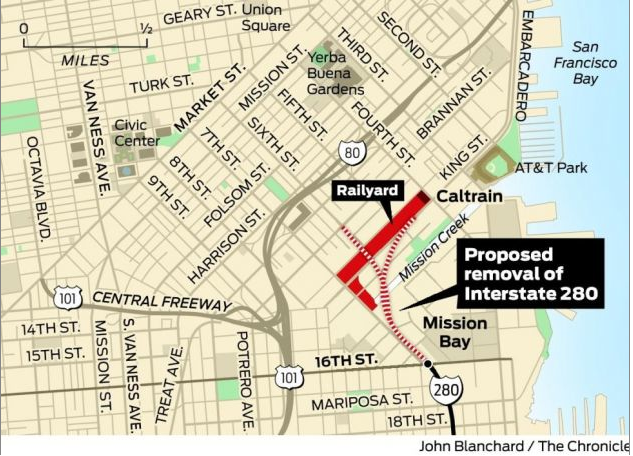 The portion of 280 to be removed as well as the Caltrain railyard. Systems Mural is nestled just in between the two. When you get the flu, viruses turn your cells into tiny factories that help spread the disease. In this animation, NPR's Robert Krulwich and medical animator David Bolinsky explain how a flu virus can trick a single cell into making a million more viruses. Metropolis II is a kinetic sculpture from Chris Burden shown at the LAMCA. Awesome! In this mind blowing video presented by TED, Drew Berry shows us visualizations of the human body's systems at the cellular and molecular level. "Manhattan sits over a gigantic plate of spaghetti." NPR reports on NYC's difficult task of repairing it's vital systems after the damage of hurricane Sandy. This includes the power, water, and transportation systems. Good luck New York! Click on this text for a link to the story. This short video goes one step beyond the surface of what it means to live sustainably. The Story of Stuff is a great resource for 'systems thinkers". It's website, storyofstuff.org has lots of videos and other information that explore economic, political and other types of systems and how to respond to them. This video was the first in the series that provides an overview of how "The System" is not operating in a sustainable way. Systems Mural Project has a new site! This is the spot for Systems Thinkers. We're going to be posting interesting articles and links to sites and stories that will raise your awareness of the interconnections going on all around you. From the practical to the profound, we'll be posting about the natural systems found within the ecology, the systems we create to try to manage this mess, and the belief systems that structure our behavior and culture.